Granted the influential position as a half-shire town in the mid-1790s, Hopkinton enjoyed a period of social and political prominence in the state, even nearly becoming New Hampshire's state capital a decade later. While the state's political hub found its home in nearby Concord, Hopkinton flourished into a town rich in industry, abundant in natural beauty, and brimming with character. Comprised of three unique villages—Contoocook, Hopkinton, and West Hopkinton—the town presents three distinctively different versions of quintessential New England life. The Contoocook River's strength was harnessed to power mills producing leather, box-making machinery, and silk. When the railroad arrived in 1850, commerce expanded and visitors arrived to enjoy the peaceful settings. Hopkinton Village became a favorite stop for wealthy travelers who enjoyed the Beech Hill Country Club and accommodations such as the nearby Perkins Inn. 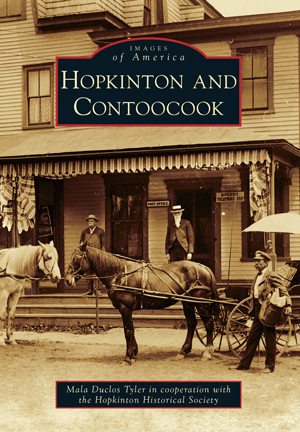 Through vintage images culled from the Hopkinton Historical Society and private collections, Hopkinton and Contoocook chronicles the evolution of these communities, challenged by natural disasters and the inevitable effects of time, and showcases their steadfast ability to maintain their allure, historical ambience, and timeless charm. Mala Duclos Tyler is among the fortunate who call Hopkinton their hometown. Five generations of her family have lived in Contoocook, and it is her appreciation for the people, places, and history of this area that fueled her passion for this book.